Free download BlueStacks latest version. It, basically an App Player, is an Android Phone software for your PC. BlueStacks App Player will help you to run all android apps on your PC. So if you want to play any App or game on your computer, this application software will help you. BlueStacks App Player supports all version of windows such as Windows XP, Windows 7/8. If you are using Windows XP, then you need to install at least .Net Framework 2 or higher. If you have already installed .Net Framework then just download this software from the download link given below. After downloading, it will start to download games data. This downloading process will take some time so sit back and wait. After this, you are asked to sync your Google account and PlayStore with this application. It will take few minutes and your BlueStacks App Store is ready to run all android apps on your computer. 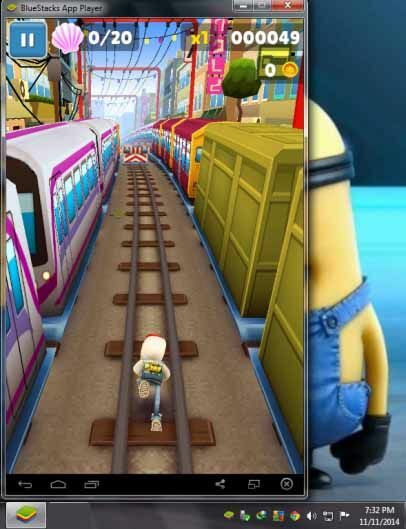 BlueStacks App Player can run all apps such as WhatsApp, Subway Surfer, Temple Run and all apps available on Google Play Store. You will see the landscape interface of this program on your PC. This will show even time at the top right corner of the screen. You will see the three buttons at the bottom as you see on your android phone. You will see all apps on home screen. At the top, it will show the apps installed on your BlueStacks App Player. Below this, you can see all popular apps. When you click any app that is not installed, you will be taken to the Google Play Store automatically. There you will see the install button as you see on your mobile phone. After clicking on Install, it will start after usual procedure. Your app will start to download and you see the icon at the top left corner. You can shutter down the running activity chart from top to bottom by clicking and dragging up to down.